All colorectal cancer develops from a single transformed cell which ultimately grows large enough to present as a macroscopic lesion involving the lumen of the bowel. The staging of colorectal cancer is most dependent upon the depth of penetration of the bowel wall and the involvement of regional lymph nodes. An increasingly wide variety of putative molecular markers for aggressiveness and metastatic potential have been analyzed; however, the two most important prognostic indicators remain the degree of bowel wall invasion and status of the lymph nodes. This fact has lead to the continued importance of adequate locoregional oncological principles when performing curative resections of colon cancer. 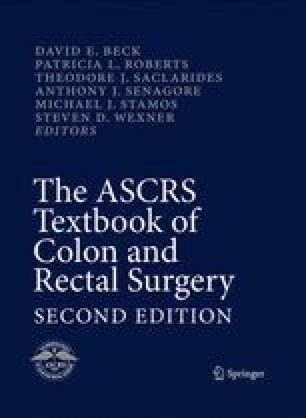 The purpose of this chapter is to primarily address issues directly related to the safe and oncologically sound methods of performing a curative resection of a colonic carcinoma. Important and related issues, such as clinicopathologic staging systems, the role of adjuvant or neoadjuvant treatments, and molecular markers are addressed in detail in other sections of this text. This chapter was written by Robert Fry and Anthony Senagore in the previous version of this textbook.